2018's Best Dash Cams Review: What is Worth Paying For? What Are the Best Dash Cams for Your Car in 2018? Dash cams are quickly becoming a popular preventive measure for drivers around the world—rightfully so, with the current distracted driving epidemic. In 2014, over 431,000 people were injured, and 3,179 were killed in accidents involving distracted drivers. And these are just the incidents reported with injury; countless more fender benders and minor collisions happen every day. A dash cam can provide evidence of how an accident happened and protect you from being falsely accused—but you shouldn’t have to dedicate a large portion of your paycheck to get a quality dash cam. Let’s dive into what dash cams can do to protect you, what features are worth paying for, and browse a few affordable options. The Falcon Zero F170HD+ captures the top spot by sweeping all our important categories for sub-$200 dash cams. It comes with full HD 1080p resolution, the widest viewing angle of all our top picks (170°), and a 32 GB microSD card. It comes with GPS software that’s compatible with both Mac and PC. What really pushes the Falcon Zero F170HD+ over the top is the five-year warranty, which is the longest we’ve seen from any dashboard camera. There’s a lot of high-level technology packed into this $120 camera. The KDLINKS X1 hits all of the requisite features for a dash cam and surpasses all but the Falcon Zero F170HD+ in wide angle view, but what’s truly impressive about this dash cam is its durability. The KDLINKS X1 has been tested and proven to last for 6+ hours in extreme temperatures—between -40°F and 170°F— so if you live somewhere with extreme weather, this is the camera for you. It touts only an 8 GB microSD card, so you might consider upgrading your storage capacity. The Z-Edge Z3 takes video resolution beyond HD to the Super HD 2560 x 1080p or 2304 x 1296p resolution. A combination of its Ambarella A7 processor and OV4689 color CMOS allows the Z-Edge Z3 to capture high-quality images even during low-light evening hours. It’s hard to find a better video quality for under $200. The AUTO-VOX D1 hits all our major requirements with 1080p HD video, 145° viewing angle, and 32 GB microSD card. It doesn’t have one particular standout like our Top 3 choices, but it’s a solid dash cam across the board, especially for $100. The Mini 0805 goes toe-to-toe with the Z-Edge Z3 in video resolution at 2304 x 1296p, and is by far the most compact of all our dash cam options. The LCD screen measures at a tiny 1.5 inches—which admittedly works against our personal preference— and the viewing angle barely squeaks by our recommended 135° mark; otherwise, this would be a Top 3 contender. But if you’re looking for a discreet, high-quality dash cam and don’t mind a smaller screen, the Mini 0805 is the way to go. How does a dash cam help me? Modern technology is all about the bells and whistles—the features. But which bells and whistles are truly important and which ones are making you pay extra just for the cool factor? 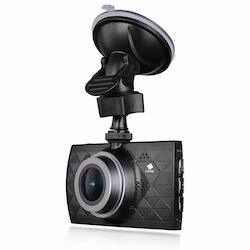 Here we dive into must-have features for your dash cam that won’t skyrocket the price tag. Full HD quality, 1920 x 1080p resolution, is a must for your dashboard camera. Most cameras will allow you to adjust your video to a lower quality but we recommend recording with the highest quality your camera allows so you can capture every detail. You don’t want to miss a license plate number or traffic light because your video wasn’t sharp enough. The more detailed video you have, the more protected you’ll be after of an accident. Don’t skimp on video quality just to save a few bucks. Since your camera will constantly record activity in full HD resolution, you’ll run out of storage space quickly. Loop recording enables your camera to automatically record over out-of-date footage that hasn’t been specifically saved once your storage is full. If you don’t have loop recording, your camera may capture an event but not have enough space to record it. The wider angle your camera lens can see, the more footage around your car you’ll capture. You want a camera with at least a 130° angle view, but the closer to 180° you can get the better. Increasing your camera’s viewing range will limit blind spots. When you need to save footage of a particular event it can be frustrating to have to sift through a menu. A lock file button lets you save recorded video with one click, bypassing system navigation and storing your footage where it won’t be erased by loop recording. The ability to instantly review and playback an incident on the spot is invaluable. Instead of settling the situation in a courtroom, you can show the footage to a police officer and prove your case in the moment. Dash cam LCD screens can range from 1.5 inches to 3.5 inches. You’ll want to find a screen that fits your style preference without impeding your view. Most of the cameras we recommend come with a 2.7-inch screen. The GPS feature on your dash cam will track your exact position and speed. This data can help prove what really happened in an accident. Some people may prefer to disable* GPS tracking on their dash cam devices. Let’s say someone hits you while you’re driving. You have the video to prove it, but the GPS data shows you were exceeding the speed limit—even just a few MPH—when the accident occurred. That data can then be used against you. By disabling the GPS, you can ensure that the data can’t be used against you when you’re not at fault. *Disabling GPS is not available in all dash cams; check before you buy. A G-sensor activates when it registers any G-force movement. Let’s say you slam on your breaks or someone hits you. The Gsensor will log the motion or collision, saving the footage and keeping it from being recorded over by loop recording. Every dash cam we recommend comes with a microSD card. Some have more storage space than others but since the storage is on a microSD, you can switch it out for a larger capacity card if you feel you need more storage space. We recommend having at least 32 GB of storage so you can capture 6 hours of HD quality video before loop recording takes over. No one dash cam is going to have absolutely everything, especially when you’re shopping on a budget. In the end, it really comes down to personal preference. Do you prefer better video quality over durability, or are you looking for the best combination and overall value? 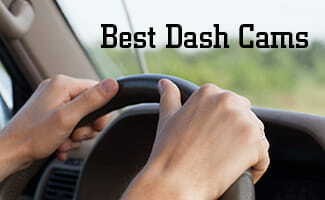 Different people will have different priorities, but keep the must-haves in mind as you shop for your dash cam. There’s no reason to spend more than a few hundred dollars. If you are also looking for security cameras for your home. Read our review on the Best Security Cameras of 2018.